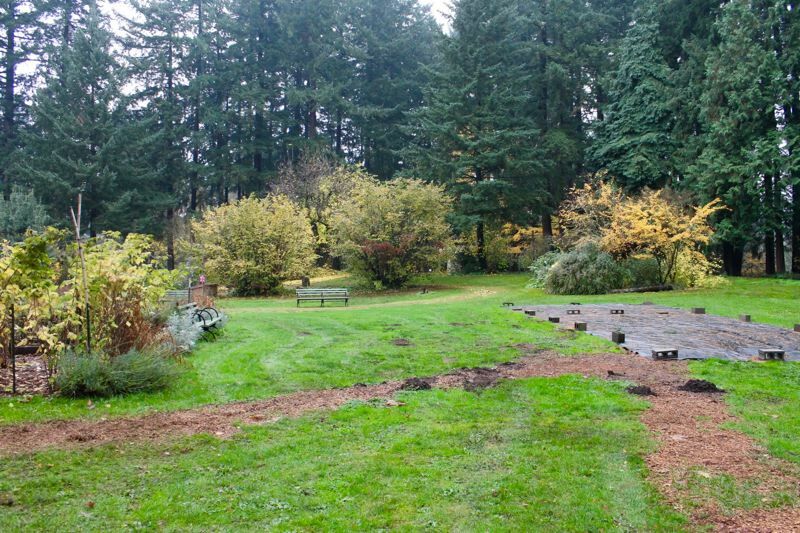 Facelift at Leach Botanical Garden will raise profile of largely unknown treasure in Southeast Portland. One would be hard pressed to find a Portlander who hasn't heard of the International Rose Test Garden or the Japanese Garden at Washington Park. But far fewer are aware of the lush, historical Leach Botanical Garden on Portland's east side, at Southeast 122nd and Foster Road. On a recent chilly weekday, Johnson Creek's waters were rushing through the 16-acre garden's middle, following long bouts of rain. The rain had paused and a fog descended on the garden grounds, snaking through the Douglas firs, while bright orange and red Japanese maple leaves glistened. The public natural area is tucked in a residential neighborhood with not-so-easy-to-find parking, a humble operation with a few employees and volunteers — mostly seasonal — working out of a worn-down house on the property. "For the first couple of years, we called it the secret garden, because no one knew about it," says Irene Bowers, vice president of the Leach board of directors and longtime Portland landscape architect. "When you're going down Foster," Bowers says, "it's this commercial, fast-paced corridor. If you don't know where you're going, just seeing the sign between two gas stations — it's like, huh? It doesn't draw you in." 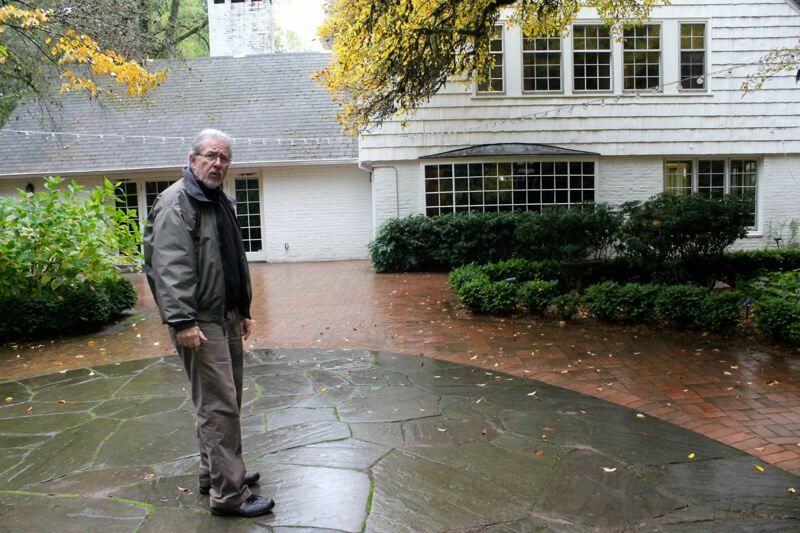 The low-profile status of Leach Botanical Garden is about to change, though. Leach Garden Friends, the nonprofit that operates the 34-year-old nursery filled with 2,000 species of plants, is making progress on a $10 million facelift that will dramatically change it by 2019. Last month, the group completed a $30,000 fundraising campaign for an aerial trail — a 345-foot-long oval walkway that will rise up through the trees, giving visitors the ability to easily stroll through the forest. "The thing that's profound about this is that there are green spaces all over the city, but they're not places where my 90-year-old mom can go," says David Porter, Leach executive director. "It will engage people close to the urban core with the woods in a way that they wouldn't be able to otherwise," he says. Fred Armisen — notable actor from the television series "Portlandia," which playfully mocks the city's hipster, quirky identity — endorsed the garden fundraising campaign in a video. Part of an episode was filmed at Leach for the show's upcoming and final season — one that has to do with "trolls and the Portland marathon," Porter said. The $30,000 walkway is part of phase one, which includes a fireplace terrace and event space, a new garden and paths, parking area, and welcoming entryway and bilingual signage. The on-site house will be demolished. A later phase will include a gift shop and offices, children's garden, events pavilion and more. Porter says the terrain at Leach provides a unique riparian greenspace for the urban area. "We have three different kinds of terrain and environment in a very compressed space, within the densely populated commercial East Portland," Porter says. Attendance is hard to track, since there is no entry fee, but Porter estimates 16,000 to 22,000 total visitors have come in the past four or five years. "There isn't another public cultural asset like this east of 82nd Avenue," Porter says. The garden upgrade follows on the heels of other East Portland projects, including the recently opened Gateway Green mountain biking park and Luuwit View Park in the Argay neighborhood. Numerous agencies have funneled dollars into the Leach Garden project, taking three years to "cobble it together," says Ross Swanson, capital projects manager at Portland Parks & Recreation. Funding includes $6.4 million from Portland Parks and Recreation; $2 million from Prosper Portland, formerly the Portland Development Commission; $1.26 million raised by Leach Garden Friends; and a $188,000 grant from Metro. Commissioner Amanda Fritz, who oversees the parks system, challenged Leach Garden Friends to raise the $1.26 million before the bureau would provide more system development charges (SDC) funding. The parks bureau acquired the property in 1972. Though the friends group operates it, the bureau maintains structures and makes sure the park stays oriented to city goals. "Because it has a botanical focus, and they're seeking out odd, small and obscure plants at times — that's not something we do. We're maintaining over 200 parks and our maintenance staff is stretched thin as it is," Swanson says. 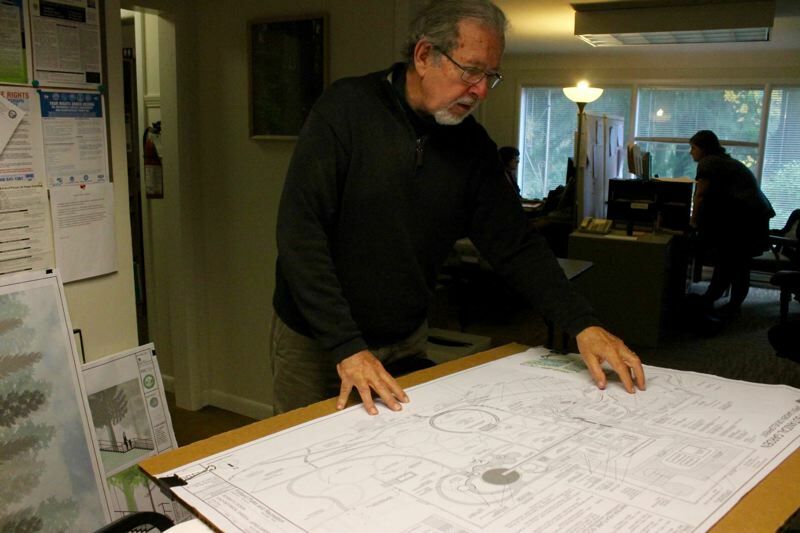 Porter, who previously oversaw the Friends of Pioneer Square group, expects Leach Botanical Garden to break ground on the next phase by September 2018 and take six months to complete. As Leach's future grows along with its plants, the parks bureau expects it will take a more active role in "maintaining assets," especially as more structures are built. Eventually, it hopes to achieve a tourism status on par with Lan Su Chinese Garden or the Japanese Garden. Then the garden may charge an entry fee. But that's a ways down the road. The garden has been in the parks portfolio for over 30 years, but Bowers says improvement efforts mostly started within the last eight years. She wondered if the Parks Bureau just didn't know what to do with it. Porter speculates that — aside from being located in historically neglected East Portland — people involved in earlier decades focused more on the site's historical story than promotion. The garden owes its existence to a tenacious woman named Lilla Leach, who had an insatiable, lifelong love of botany. Born in Clackamas County in 1886, she studied botany at the University of Oregon, teaching in Eugene for five years. Earlier, she met the love of her life, John Leach, at the Tualatin Academy in Forest Grove. He initially was unsuccessful at wooing her. John ultimately won Lilla over, according to the Oregon Encyclopedia, by assuring her he knew how to handle pack animals and "could take her where the cake-eating botanists could never get." They were married in 1913 and then moved to Portland, where John opened a successful pharmacy business. Together the two explored Oregon, collecting plants. Lilla made some particularly important discoveries, including a pink-flowered shrub that had never been noted before by botanists. The plant, in the heath family, was named Kalmiopsis leachiana after the couple. In 1931, John and Lilla bought the East Portland property from Jacob Johnson, who operated a sawmill that furnished lumber for some of the first homes in Portland. John and Lilla didn't have children, so in their will, they wanted the garden, which they named Sleepy Hollow, to be left to the city and state. Their original parcel was 4.5 acres, but the city and Metro later bought more land to expand it to the current 16 acres. "They stipulated in the will that it should be a public botanic garden and museum," Porter says. But if the city didn't do anything with the property, after 10 years it would revert to the Southeast YMCA. By 1981, the city hadn't done much with the property, and former Parks Commissioner Charles Jordan started getting calls from neighbors. "He had the paperwork to sign the deed over to the YMCA, and people were calling him, saying, 'Don't do anything until you go see it,' " Porter says. "He drove out, he thought, 'Oh my God. It's a gem. We have to keep it.' "
The city, which had been treating it as a rental property, then opened it as a public garden. The Leach Garden Friends formed in 1983, responsible for day-to-day management. Fast forward to 2017: As Portland swells in population and density, it gives green space preservation all the more imperative. But will all these fancy expansions and additions take away from its unassuming, "Sleepy Hollow" identity? "No, I don't think so," Bowers says. "I think any place goes through transitions. As its history started to unfold, we thought about that and had long, long talks about it with the board and our citizens advisory group. "We had these conversations about, is there going to be a detraction from the historic part, and how do we weave that in? That was really solved beautifully by our designers," Bowers assures. Of course it'll look different, she says — but for the better. "I think it's just expanding on the garden as a true botanical garden. The Leaches started out wanting to have that. I think we've just taken it into the 21st century and looked at how we can showcase these collections, not only of what Lilla has done, in terms of her discoveries down in Southern Oregon, but also what are some of the new plants that are coming onto the market. "I think for the neighborhood, we've always looked it as a refuge from day-to-day life in a pretty hectic city. Once you walk into the garden, everything else just goes away," Bowers says. "All the stress and the troubles and everything seems to get stripped from you automatically because you're in such a beautiful place." Find out more at leachgarden.org.